For those natural, woody tones, either of the cheap acoustic bass guitars featured on this page will give you great sounding recordings, a reliable companion at those more intimate gigs and many hours of amp-free practice time on the road and in the bedroom. 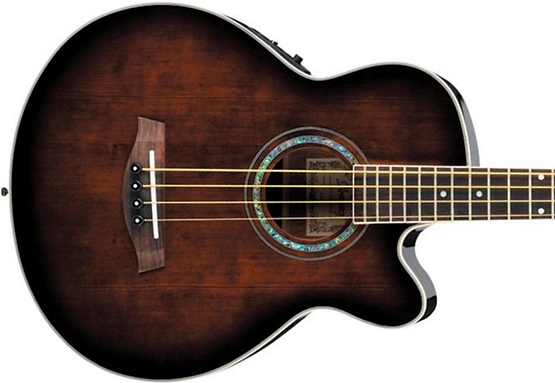 Acoustic basses are also great for beginners on a budget - no amp required, and if you do get your first gig sooner than you expect there's always the on board pickup for a line out. Technically, these are electric-acoustic bass guitars, but pure acoustic basses are quite rare and a pre-amp is commonly fitted as standard - good to have for recording and/or when you start playing in a band situation. Summary Slim neck, 24 frets, loud acoustic sound, passive pre-amp. Best for unplugged, casual use/practice or as backup. Flat fretboard, 22 frets, active pre-amp, Fishman pickup, XLR output, tuner. Best plugged in and suitable for gigging. At this price, you'd expect a lot of cut corners, but as far as materials, build and overall tone, Dean have maintained their reputation for decent quality at the budget end of the spectrum. Keep in mind this is a no-frills beginner/backup bass ideal for practice and casual use. It's a basic mahogany bass with a capable Piezo pickup, passive pre-amp (no battery required) with slider controls, large body and long, slim neck with 24 frets, although the lack of a cutaway might restrict movement to the 24th fret. The large chrome tuning pegs adjust smoothly and everything stays in tune. Surprisingly lightweight considering the amount of mahogany in this thing! A few minor tweaks to the bridge can yield a relatively low action for bass. As with any guitar or bass this cheap, it might be worth taking it to your local tech for a setup if you find, as some have, the frets and truss rod need a little attention. Once setup, along with a string change, you'll notice a huge difference. The EAB is LOUD. Even acoustically its beefy tone will carry in small venues. The mahogany naturally increases its mid-range presence to give the bottom end some much needed articulation. Using flat wounds will help reduce finger slide noise and give the tone some punch. You can get some deep, natural, upright sounds from this using flat wounds. The PS-900 panel offers basic tone and volume control via two sliders. Plugged in, it sounds more in its element when the tone is darkened. The long scale length and deep body gives it the fatness it needs with plenty of volume. Overall it's a simple bass with a simple, albeit powerful sound. Casual players are thrilled with its playability and more experienced players are equally as impressed at the quality for price. With a professional setup, and played through the right amp or PA mix, there's no reason why it can't prove gigworthy. But ultimately it's more suited as a backup or something to have around the house or on the road. It covers all the essential criteria. For $200 more than the Dean EAB (above), you get a more lavish violin sunburst finish, more feature rich pre-amp, XLR output, a cutaway and of course the endorsement of one of the finest bass makers on the planet. The Ibanez AEB10E is also preferred by those who want a smaller body. More compact than the Dean, with a shorter 32" scale, the AEB10 boasts Fishman Sonicore electronics through a Shape Shifter preamp with a handy on board tuner. It's an active pre-amp, unlike the EAB, which means you'll need to pop in a 9V battery. But, as a result, you'll have much more power and presence for live performances. Ibanez' attention to detail is as impressive as ever with the beautiful violin sunburst finish and consistently solid construction out of the box. Great unplugged volume and tone considering the smaller body size. Plugged in, it's slightly warmer than the EAB with more tonal range thanks to the high quality Fishman pickup and active AEQ-SST pre-amp. You can add plenty of sizzling brightness to the darkness of the mahogany with the treble control. The EQ gives you dual band (bass/treble) control over your tone to complement your amp settings. The XLR ouput to the standard 1/4" jack gives you the additional option of a balanced line out, straight to the mixing board for high quality recording or live PA output. It's worth commenting on the fretboard, with a flatter radius than most - typical Ibanez profile. Many find Ibanez basses to be some of the most playable around for this reason. With active electronics and a strong pickup, the AEB10E is a far more capable gigging instrument than the EAB.